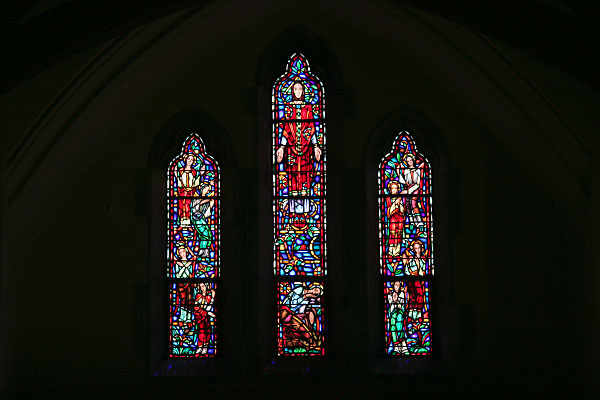 All the stained glass windows in Bethel Church were designed and made by Emil Frei, Inc., St. Louis, Missouri. 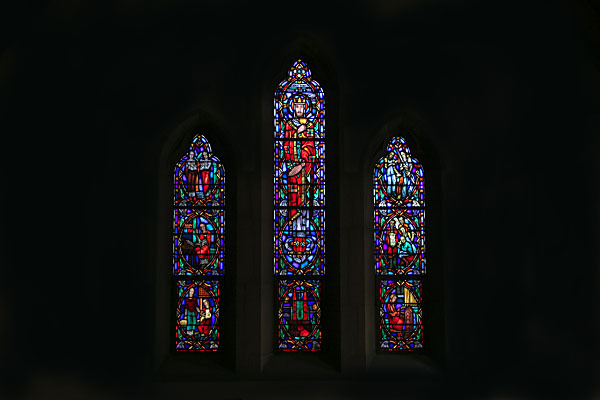 The windows in the chancel, in the transepts, and over the narthex are of the medieval type of stained and painted glass used extensively throughout the thirteenth century. They are not essentially illustrations, but appeal chiefly through the medium of color. The primary intention is to create a reverential interior. 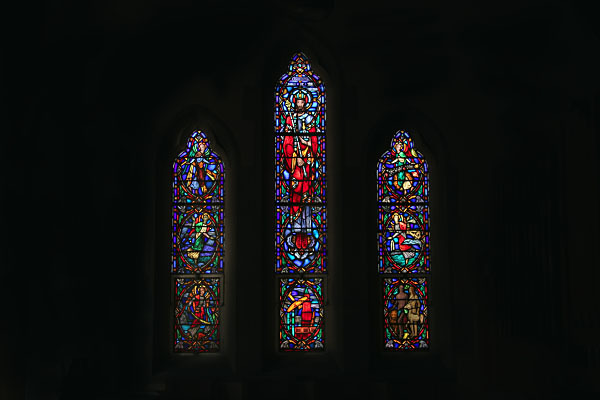 Accordingly, the figures in these windows are designed and placed so as to bring about a decorative and monumental effect rather than a naturalistic one. In this window blue predominates, because blue is the softest of the three primary colors and for this reason strains the eyes less than the more intense colors. 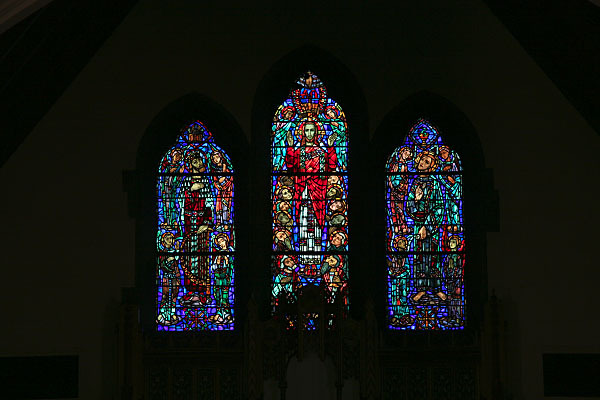 In the center is the Ascending Christ with the Apostles grouped about Him, in the left hand panel David who in Psalm 47 prophesied the Ascension, and in the right hand panel St. John the Divine, because of his description of the Exalted Christ in Revelation 1:12ff. At the top of the center panel a Hand protrudes through the clouds, symbolizing the power of God the Father. In the blue background below the Hand is the Alpha and Omega, the first and last letters of the Greek alphabet, indicating that Christ is the beginning and the end of all things. The Ark of the Covenant in the left panel is a symbol of the Old Testament, the Chalice in the right a symbol of the New. In the center panel is the figure of Christ holding a Scepter in His right hand and a Globe in His left. The Scepter indicates His kingly power and the Globe the Christian world. 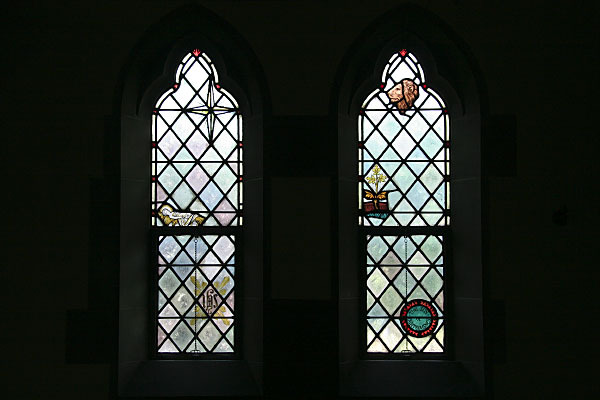 In the panels to the right and left the Six Days of Creation are shown in a symbolic way. In the center panel Christ holds a Cross in His right hand, symbolizing the Christian Church, and a Chalice in His left, symbolizing the Holy Communion. In the medallion below the figure of Christ, a Church embedded in solid rock indicates the permanency of the Christian Church. 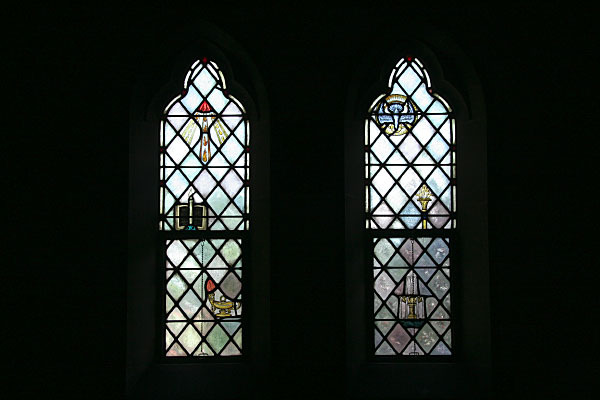 In the right and left panels six medallions represent the various works of man for the Church of Christ. They are Music, the Christian Hymn, Architecture, Labor, Literature, and Charity. At the bottom of the center panel Jacob is shown asleep with his head resting on a stone. Above him the figure of God appears. The Triangular Halo represents the Holy Trinity. Throughout the blue background Stars are placed. In the left hand panel Angels Ascending the ladder are shown, while Descending Angels appear in the right hand panel. 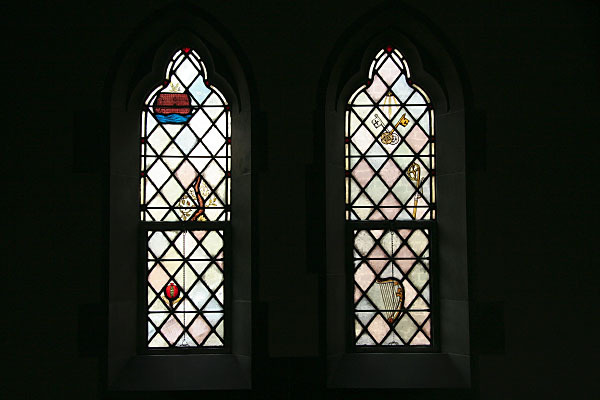 The nave windows, as well as the windows in the south walls of the transepts, are of the fragment type of glass. 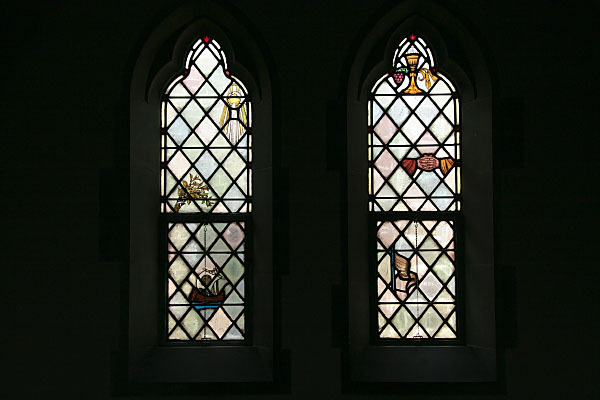 Centuries ago many details from older windows came into the hands of prominent English families and for a long time were stored away in cases. 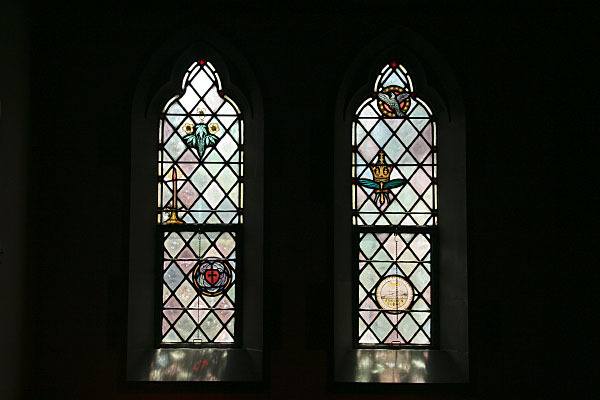 Eventually many of these fragments were placed into windows, usually in irregular patterns, such as are used in the nave windows of Bethel Church. These windows are grouped in pairs. 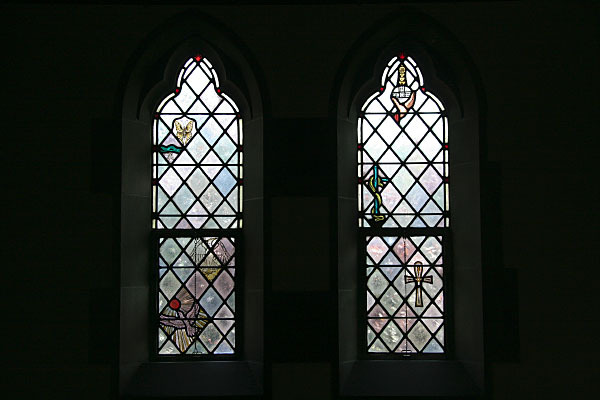 In viewing them, begin with the group to the right as you enter the church and return on the west side. 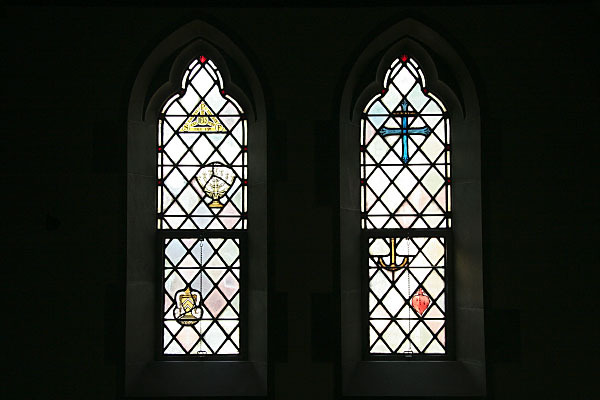 The explanation of the symbols begins with the left window, always proceeding from the top of the window to the bottom. Left panel. — The Lion of the Tribe of Judah, Revelation 5:5. — The Branch of Righteousness, Jeremiah 33:15. — The Sun of Righteousness, Malachi 4:2.  — These symbols indicate the fulfillment of the Messianic prophecies in Christ. Right panel. — The Star of Bethlehem, Matthew 2: 9. — The Christ-child in the manger. — The I H S, an ancient Greek monogram of the name Jesus. Left panel. — The Descending Dove, representing the Outpouring of the Holy Ghost, Acts 2. — The Torch, a symbol of spiritual illumination. — The Fountain of Grace, Zechariah 13:1. Right panel. — The Twelve Tongues of Flame, representing the Descent of the Holy Ghost, Acts 2. — On open Bible with the text “Verbum Dei Manet In Aeternum,” 1 Peter 1:35, a symbol of Inspiration. — An ancient Lard Lamp indicating spiritual illumination. Left panel. 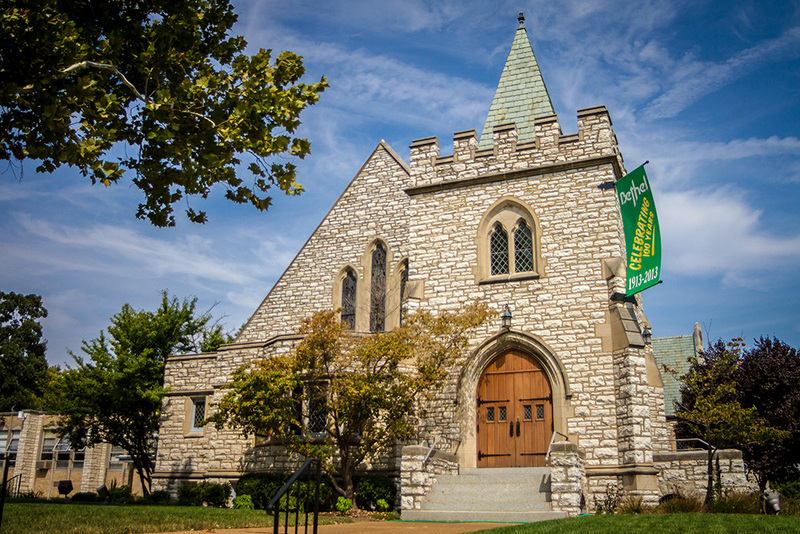 — The Eagle, just beginning to soar, representing the Missouri Synod at the time of its organization. — Twelve Stars, representing the twelve original congregations. — The Crown and the Palm Branches symbolizing victory. 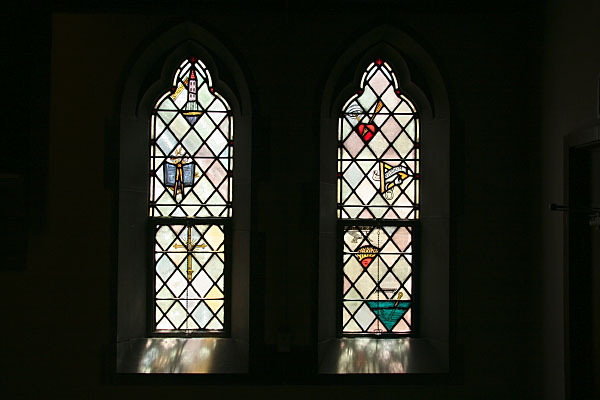 — The Seal of Concordia Seminary with the inscription, “From above the Light.” Right panel. — The Christmas Rose. — A Candlestick symbolizing the text, “Ye are the light of the world,” Matthew 5:14. — The Coat of Arms of Martin Luther. Left panel. — The Heart pierced by an arrow and the All-seeing Eye of God symbolizing the Fear of God. — The Triangle, emblematic of absolute and unfailing Wisdom. — The Eagle soaring high above the horizon and seeing the light of day, even before it is evident to those on the surface, a symbol of Intellect. An Anchor at the bottom of the sea, representing Counsel. Right panel. — A Tower on a foundation of rock, the symbol of Strength. — A Book and Dividers, representing Science. — The Cross as a symbol of Holiness. Left panel. — The Sacrament of Holy Communion. This is represented by a Chalice and Wheat and Grapes. — The Interlocked Fingers indicate the union unto one faith. — The Banner is the symbol of the Christian’s confession of faith. Right panel. — The Sacrament of Holy Baptism. This is represented by a Shell from which water is poured and by a Bundle of Hyssop which was used in the Old Testament for the sprinkling of water. — The Ship sailing into its harbor indicates that Baptism starts the Christian soul on its course to everlasting life. Left panel. — The Crossed Keys, indicating the confession of sin. — The Shepherd’s Crook indicating the Ministerial Office in Absolution. — The Harp, emblematic of thanksgiving. Right panel. — The Ark, a symbol of the Church, 1 Peter 3:20. — The Vine, symbolizing the union of the Church with her Lord, John 15:5. — The Pomegranate, emblematic of the unity of the Church. Left panel. — The Cross the symbol of faith, the Anchor the symbol of hope, and the Heart the symbol of charity, 1 Corinthians 13. Right panel. — The indwelling Trinity represented by the Shield of the Holy Trinity. — The Seven Armed Candlestick symbolizing the seven gifts of the Holy Spirit to the Church, Isaiah 11:2 or Revelation 5:12. — The Censer emblematic of prayer. All photographs are ©2005 Jim Balogh Photographer and are used by permission.